Updated Monday March 25, 2019 by Kanata Baseball Association. 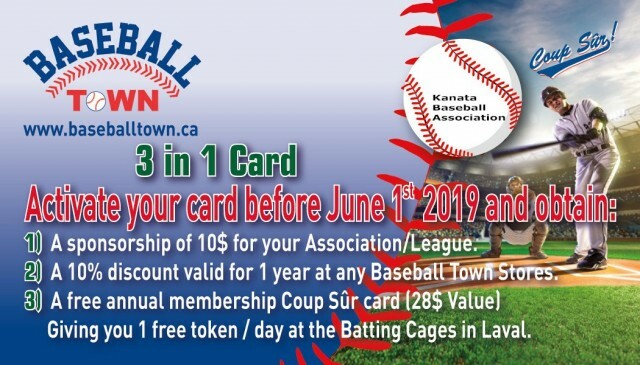 In collaboration with Baseball Town, Kanata Baseball Association is pleased to offer you a free Baseball Town membership card worth 28$ that gives a 10% discount for 1 year on your in-store purchases. How does it work! Present yourself at Baseball Town Ottawa with PDF membership card Photo attached. Baseball Town will also give $10 per activated card directly to the Kanata Baseball Association.